This program is really, really, really stupid. This was the game I just played against it. Here is one of my games. 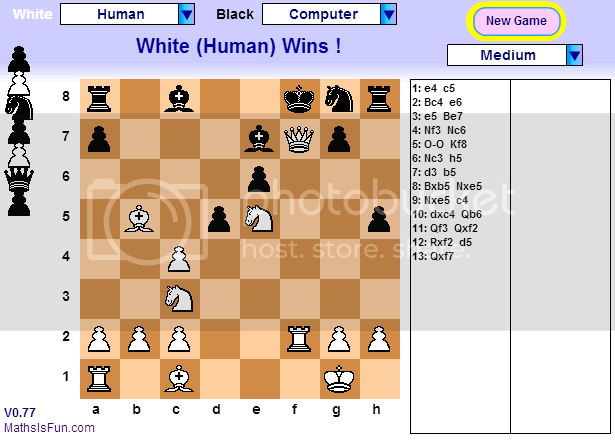 It is true it doesn't play very well but it is every programmers dream to write a chess program. 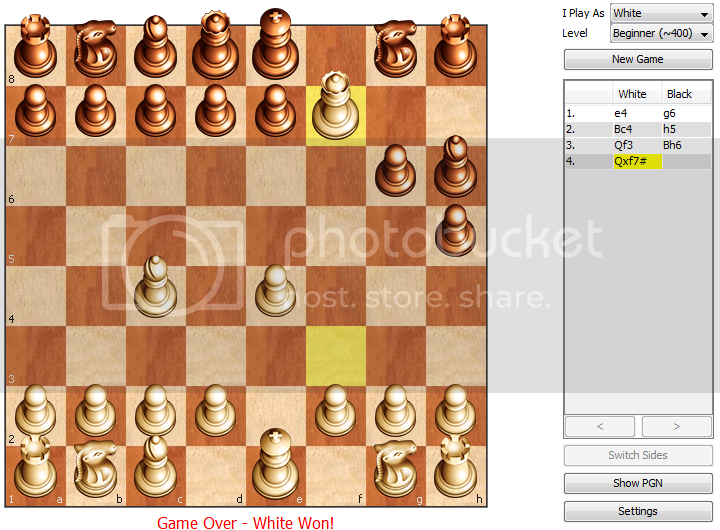 It is a great achievement to write one, no matter how well it plays. Try this one when you are feeling good. It is a watered down version of the grandmaster strength shredder but it is still formidable. One of my final positions with it where I had white is below. Easy level is easy to beat but the other levels are tougher. That is about as good as I can get it with limited computing power. A rewrite in Actionscript could give it 10x the speed and allow deeper thinking. Not knocking it Maths, it plays better than mine did. Sorry, MIF for this incredibly off the wall attempt at a compliment. It does sound like a knock. I was trying to make a point to Jane and tripped over my own tongue doing it. I didn't want to sound like I was rebuking her statement and started fence straddling. I cannot ascertain how well that program plays based on one or two results. Hey Bobby, please explain. Is Shredder yours? Heck no! Stefan Meyer-Kahlen wrote Shredder. It is one of the strongest engines in the world. I was just a guy who was interested in AI. So ... don't be shy ... tell me about the AI. I was once a member of the AAAI, y'know. I think you are overestimating me. 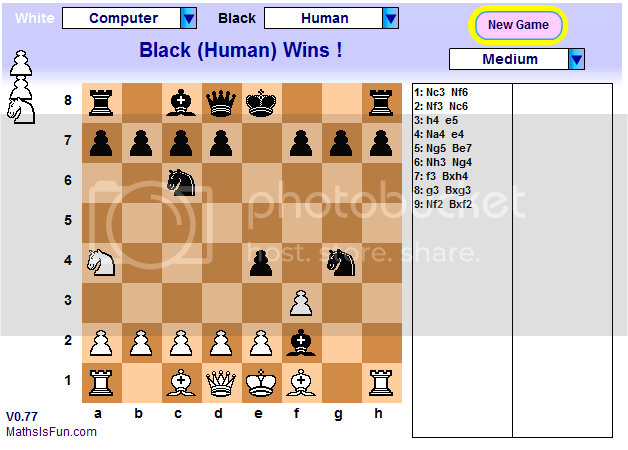 As soon as I learned the minimax algorithm I wrote some chess engines to solve specific chess positions. They didn't do a very good job. You see I knew nothing of Alpha - Beta pruning, razoring, iterative deepening, bitbases, or tablebases. All the things that make todays engines strong. I became interested in machine learning but thought the modern attempts were junk. From Turing's love letters to shrdlu and eliza to Doug Lenats monstrosity. I Came to Vegas and wrote some stuff to solve specific gaming problems. Then I began to work on an intelligent poker program. I made some progress but the legendary draw poker expert Mike Caro (The Mad Genius ) completed Orac before me. I could see that he was miles ahead of me so I stopped. Then I heard that a lot earlier Marvin Minsky and Terry Winograd ( I think ) had written an expert system that scored better on the MIT calculus exam than most humans could. I became fascinated with the thought of computer algebra. My brother ( jimmyR, also on this forum at times ) and I set out to write our own CAS. I got about 1/4 of the way done when I discovered Mupad 1.4 lite on the internet. It was again way ahead of my package. My career in programming and AI stopped right there. This program is really, really, really stupid. Not as stupid as this one.